"So I have to be honest, I've never liked him much," Trump said. "I really probably never will. But there are certain reasons for it." Meghan McCain, the daughter of the late senator, spent the last few days defending her father and politely criticizing Trump. On Wednesday she said the president had reached "a new, bizarre low - attacking someone who is not here is a new low." 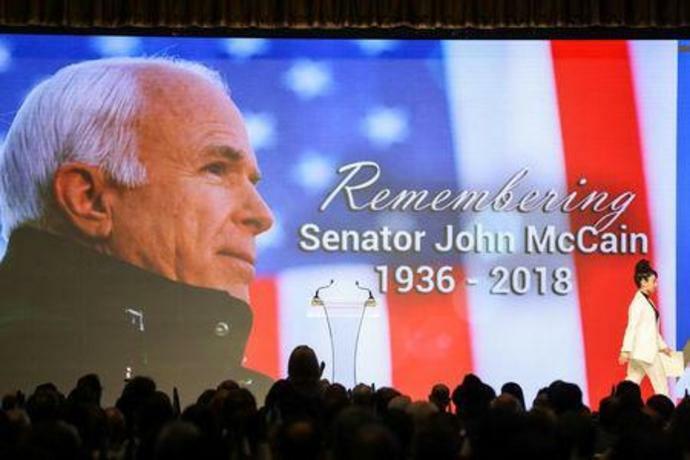 On Tuesday, speaking to reporters in the Oval Office while sitting next the president of Brazil, Trump added: "I never was a fan of John McCain, and I never will be." Trump on Wednesday expressed concern about McCain's role in the handling of a "dossier," compiled before the 2016 U.S. presidential election by a former British spy and paid for by lawyers for the Democratic Party and Hillary Clinton's presidential campaign. "John McCain received a fake and phony dossier ... He got it, and what did he do? He didn't call me," Trump said during his visit to the Ohio factory. "He turned it over to the FBI hoping to put me in jeopardy and that's not the nicest thing to do."